The Times, Daily Mail, Daily Telegraph, Daily Mirror and BBC News report that the Russian military were involved in a global cyberattack. We have entered a new era of warfare, witnessing a destructive and deadly mix of conventional military might and malicious cyberattacks. Russia is ripping up the rule book by undermining democracy, wrecking livelihoods by targeting critical infrastructure, and weaponising information. We must be primed and ready to tackle these stark and intensifying threats. The Sun and the Daily Mail report on allegations made by Leigh Day on British troops, saying that an individual ‘says he arranged hundreds of false abuse claims against UK soldiers to win huge Ministry of Defence payouts’. The law firm says that ‘should any of the remaining claims appear to be false or otherwise without merit as the review process continues, we would of course take the appropriate steps in accordance with our professional obligations with the court’. 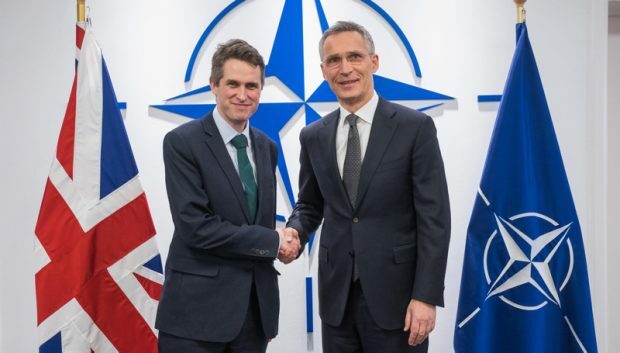 Left to right: Gavin Williamson (UK Secretary of State for Defence) shaking hands with NATO Secretary General Jens Stoltenberg at NATO Headquarters in Brussels.